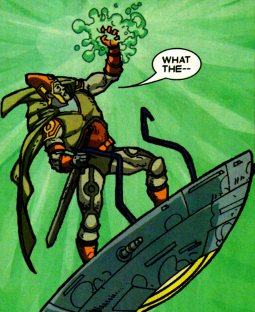 Powers/Abilities: While a major clan-leader like Metz wielded a sword, shield, and battle axe, there were multiple warriors who used some sort of hover/flight disks, as well as gloves that could unleash energy blasts. Bwokk had, at least, its Central Spaceport, presumably indicating the residents of Bwokk not only received interplanetary visitors, but also possessed interplanetary, if not interstellar, ships themselves. They also possessed airships that could engage in aerial combat. Traits: The population of, at least, a portion of Bwokk was divided into various feudal clans. It appeared that there may have been one chieftain who ruled over the various clans. Once a powerful chieftain perished, the various clans battled, so that their chieftain might fill the resulting power vacuum. There is some evidence to support the existence of gladiatorial arenas, presumably for both public entertainment as well as potential punishment of enemies, prisoners, etc. (Annihilation: Ronan#1 (fb) - BTS) - There was apparently long-standing feuding/hostilities between the Lo-Kala and Qa-Kaba clans. (Annihilation: Ronan#1 (fb) - BTS) - A marriage was arranged between Homma of the Lo-Kala and Metz of the Qa-Kaba, and their union was to forge a lasting bond between the two clans and signal an end to hostilities. (Annihilation: Ronan#1 (fb) - BTS) - Metz found Homma in bed with his shield-bearer, and -- as was his right by local law -- he executed both of them. (Annihilation: Ronan#1 (fb) - BTS) - Exiled from the Kree planets based on information provided in testimony by Tana Nile, Ronan traveled to Bwokk in search of Tana Nile, possibly based on information from the mercenary Tullk. (Annihilation: Ronan#1) - As he walked through a crowd of beings, Homma's mother, Nonna, berated Metz for destroying any hope of reconcilation between their clans by slaying her daughter. Eventually Metz silenced Nonna with a slap to her face and then lifted her by her dress into the air, telling her that the only voice there was his and that no one would waste breath on her whoring daughter. 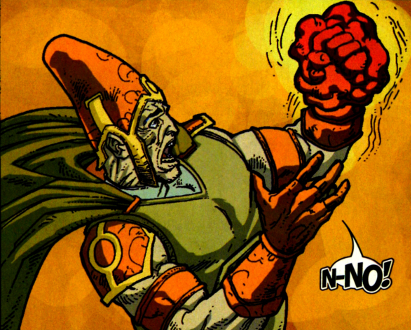 He was interrupted by Ronan, who -- following the written law of Koth that stated wheresoever Kree sets foot so shall Kree law hold sway, and ignoring the fact that he had been stripped of his rank of Supreme Public Accuser -- chose to speak for the deceased Homma and named Metz as the accused. Metz drew his sword and tried to defend himself, but Ronan shattered the sword with his Universal Weapon and then backhanded the much smaller Metz, knocking him down and out. Nonna told Ronan to wait, but Ronan then dragged the unconscious Metz by the ankle into what looked to be a gladiatorial ring (or some other sort of arena), stating they were adjourning to a setting fit for the administration of Kree law. Nonna followed, and another spoke out, telling Ronan they weren't beholden to his absolutist laws, as things were different on Bwokk. Ignoring this, Ronan ordered Nonna to state her name and repeat the offense, which she did, confirming that Nonna was now dead at Metz's hand. Nonna tried to explain further, but Ronan interrupted her and asked the revived Metz how he pleaded. Metz defiantly spit on the ground, telling Ronan he neither recognized nor acknowledged his authority. 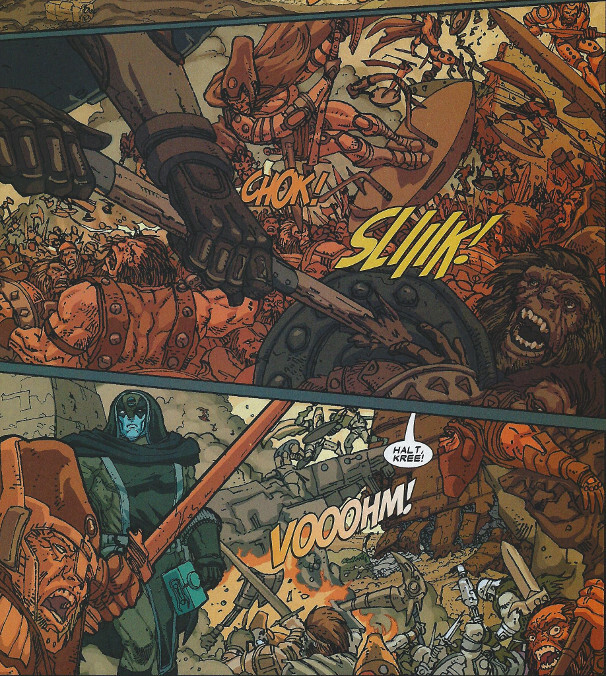 Reiterating the law of Koth, Ronan asked Metz if he had killed Homma, even though their union would have meant an end to the dispute between their two clans. After Metez had replied in the affirmative to both questions, Ronan asked if he had anything to say in his defense, and the still defiant Metz replied, "Not to you." 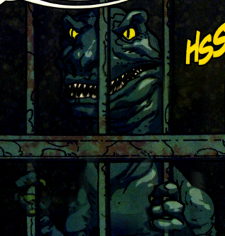 Ronan then sentenced Metz to trial by combat, releasing a trio of velociraptor-looking creatures for him to face with his battle axe. The reptiles swiftly surrounded and then leapt upon and began tearing into Metz, who screamed in pain. As Ronan walked away, Nonna asked "What have you done??" He told her he had passed judgment, and justice had been done, but she covered her face and sobbed, noting that she had been angry, but that she had not meant nor wanted this. Ronan told her their business was concluded, and he departed to meet with Tullk. Soon after Ronan departed, rioting began, as all of the clan chieftains sought to fill the power vacuum left by Metz's death. (Annihilation: Ronan - BTS) - Tullk explained to Ronan the circumstances of Homma's death and noted that Metz had every right to kill both her and her lover. Ronan replied that this was irrelevent, and that justice had been done. 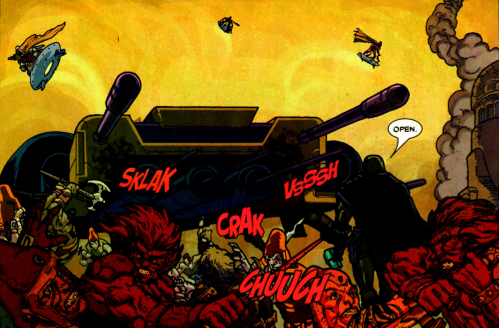 (Annihilation: Ronan#1) - As the warriors of the various clans battled, one of the (presumably) Qa-Kaba shouted out, "For Metz!" Ronan ignored the battle and proceeded toward his ship, but the (another similarly outfitted and flying disc-riding presumptive) Qa-Kaba told him to halt; as Ronan was the casue of this violence, he could not allow him to pass. Protected by a force field, Ronan told his assailant he had no quarrel with him, but he stood between Ronan and his ship, which was counter-intelligent. Ronan blasted the Qa-Kaba out of the sky with his Universal Weapon, and then commanded his ship to open. As a trio of Qa-Kaba approached, Ronan announced the conflict was over, and then he caused a weapon in one of their gloves to overload and explode, killing him. Ronan entered his ship and departed, glancing back but once to observe the fierce struggle among the people below. Comments: Created by Simon Furman and Jorge Lucas. While there was not a single race seen, the various clans to seemed to be more of a standard, semi-humanoid variant; the less humanoid variants may have been alien visitors, or perhaps there were Deviant variants or something.. It wasn't specified, but Metz would likely be the leader of his clan, and perhaps he ruled a union of multiple (or perhaps all) clans...otherwise, why would all of the clan chieftains be warring to try to fill the void his death left? I had originally planned a single profile for the planet Bwokk, but despite it only using up half of a single issue, there were a ton of images showing the environment, the various peoples, locations, etc. When I tried to put it together, it was a disaster image-wise, because I can't prevent the images from overlapping, etc. There may be a few such instances anyway, but this is much better. Anyone else with similar names, etc. (Annihilation: Ronan#1 - BTS) - Neither appreciating nor caring about the local laws, Ronan the Accuser executed Metz for Homma's murder based on the accusations of Homma's mother, Nonna, and Metz' refusal to argue his case against the alien Ronan; this led to war amongst the various clans as their chieftains sought to fill the power vacuum resulting from Metz's death. (Annihilation: Ronan#1 (fb) - BTS) - Metz found Homma in bed with his shield-bearer,, and -- as was his right by local law -- he executed both of them. The Qa-Kaba clan was apparently one of several clans on the planet Bwokk. Members: Metz, Metz's unidentified shield-bearer, others unidentified (none beside Metz were clearly identified or pictured); I pictured the people in the attire of someone who yelled "For Metz! ", though it is unconfirmed whether they were Qa-Kaba, or whether he was just popular among multiple clans. (Annihilation: Ronan#1) - Neither appreciating nor caring about the local laws, Ronan the Accuser executed Metz for Homma's murder based on the accusations of Homma's mother, Nonna, and Metz' refusal to argue his case against the alien Ronan; this led to war amongst the various clans as their chieftains sought to fill the power vacuum resulting from Metz's death. As the warriors of the various clans battled, one of the (presumably) Qa-Kaba shouted out, "For Metz!" Ronan ignored the battle and proceeded toward his ship, but the (another similarly outfitted and flying disc-riding) Qa-Kaba told him to halt; as Ronan was the casue of this violence, he could not allow him to pass. Protected by a force field, Ronan told the Qa-Kaba he had no quarrel with him, but he stood between Ronan and his ship, which was counter-intelligent. Ronan blasted the Qa-Kaba out of the sky with his Universal Weapon, and then commanded his ship to open. As a trio of Qa-Kaba approached, Ronan announced the conflict was over, and then he caused a weapon in one of their gloves to overload and expload, killing him. Ronan then entered his ship and departed, glancing back but once to observe the fierce struggle among the people below. At least a trio of these creatures were kept in cages in what looked to be a gladiatorial arena. They were about 4' tall (to the top of their head, since they stood on two legs), and had sharp claws and teeth. (Annihilation: Ronan#1) - After knocking out Metz, Ronan dragged Metz into the arena. 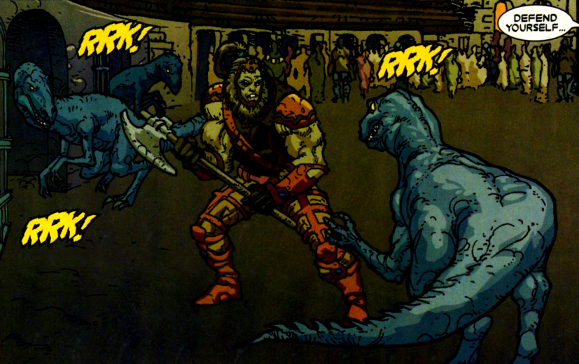 After deciding Metz was guilty, Ronan sentenced Metz to trial by combat, releasing a trio of velociraptor looking creatures for him to face with his battle axe. The reptiles swiftly surrounded and then leapt upon and began tearing into Metz, who screamed in pain and presumably perished soon afterward. The two identified people, Metz and Nonna, were from different clans, but seemed to be of similar genetic background...they were grossly humanoid, with significant bodily and facial hair. However, there were numerous others observed that were dramatically different, with a variety of forms and appearances. In addition to the two images shown in this sub-profile, there are more to be seen in the main entry, immediately after the history heading, as well as in the Bwokk profile, in the arena subprofile...and probably in a few other parts of the Bwokk and Bwokkians profiles.